The Daily Net had a chance to talk to the Instagrammer about why she decided to take on the reality behind the Instagram posts. Instagrammer Sara Puhto has one simple mission: to show the reality of those 'perfect' Instagram posts. 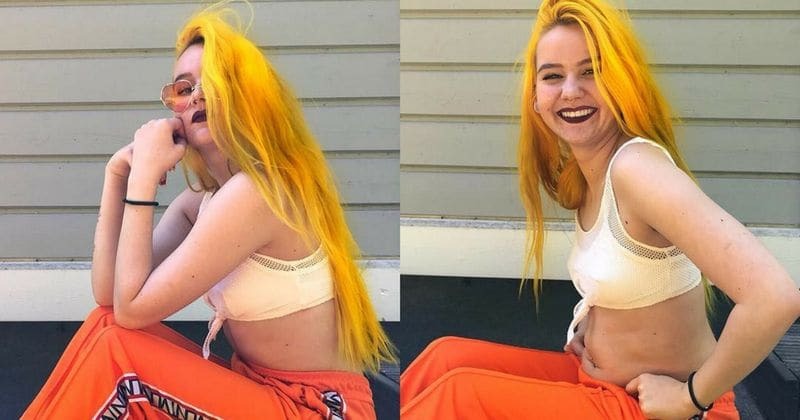 The 21-year-old Finnish blogger and all-round positive human being has been sharing posts showing how drastically different you can look, just by strategically posing! The Daily Net talked to the model about why she decided to take on the reality behind the social media posts. 1. On why she started showing the real side of social media: "I started showing my reality behind Instagram because you never know what someone is going through." 2. "I felt like I was the only one constantly looking at images on Instagram and feeling like I was never good enough, as I was comparing my body to all the "perfect" pictures on Instagram." 3. "But I started realizing I wasn't the only one and I didn't want others to keep feeling the way I did, being obsessed with this idea of having to look 'Instagram-worthy' all the time." 4. "So I started posting photos of what the reality is behind my Instagram photos. Sometimes we forget that simple things like bloating and tummy fat are completely normal things to have!" 5. On current beauty standards: "I think they can be really harmful. I feel like there should be no such thing as beauty standards. It makes people think they need to change themselves in order to achieve beauty." 6. "It makes us think that we aren’t beautiful just being ourselves and that there is only a certain type of beautiful." 7. On who inspires her: "As cheesy as it sounds, my biggest inspiration is my mom. She always manages to have a smile on her face, even through tough times." 8. "I have never met a stronger person in my entire life. It doesn't matter how much she is hurting or what we're going through, she always makes sure that my sisters and I are okay." 9. "Over the last few years, we have become really close and can talk about anything. She inspires me to be a better person and is always there cheering me on." 10. On how she handles all the hatred that comes with her truth: "I used to struggle with it a lot at first. But now I just brush it off and ignore the hate because I’ve realized you can’t satisfy everyone and there will always be someone with something negative to say." 11. "As that saying goes; you can be the prettiest rose in the garden, but there will always be somebody who doesn’t like roses." 12. On how she keeps her positivity on an all-time high: "I try to look for the positives in all situations, even when it seems like there is none." 13. "For example, during the holiday my sister and I got stuck in an elevator, which I've continuously had nightmares about." 14. "Instead of instantly panicking and feeling doom, I thought about the fact that at least I’m stuck here with my Sister and not alone, at least this will help me face one of my fears and appreciate the little things of the remainder of the day when I do get out." Sara's positivity is exactly what the world needs! Keep up the amazing work, Sara. We love your inspiring work!